Getting Old From New | What Smells So Good? A major plus to being in a nutrition program at college is constantly being around people as obsessed with food as I am. Even while eating lunch after Sanitation and Food Safety classes (which are not a good way to gain an appetite... photos of tapeworms, anyone? ), that's almost all we talk about! Conversations today turned to the yumminess that is the wonderful eggplant, due to the fact that I had brought some leftover Veggie Bake with me (I've made it three times so far, I think I'm hooked!) and it was so fragrant and pretty looking, even in it's Tupperware container, that my friends Johanna and Sabrina asked me what it was. I explained, and promised to share the recipe, while we all agreed that eggplant was a delicious veggie. Of course after eggplant was mentioned, attentions turned to ratatouille (both the movie and the dish!). Johanna has never had the French casserole before, and Sabrina and I took turns explaining it - finding out that we had slightly differing recipes that sounded equally yummy! 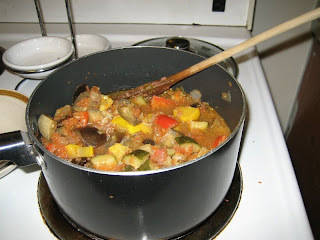 This is my mom's recipe for the stovetop version of ratatouille (I shared the mcrowave version here). It is, like any other stew or casserole, pretty variable based on what you have on hand - of course, the main ingredient being eggplant, you will want to keep that in at least! Sabrina and I agree that neither rosemary nor dill was really a complement to this recipe, and this one uses basil and oregano instead. Also, make sure that the veggies are cut pretty evenly in size (and small) so that a) you don't bite into an under- (or over-) cooked vegetable and b) you don't have to take a huge mouthful of just one veggie. Other than that, everything is fair game! What a delicious way to get your 5-a-day! Heat water in a large pot over medium-high heat. Add onion and carrot and cook, stirring occasionally, until onions are beginning to brown, about 10 minutes. Stir in garlic, eggplant, zucchini, red pepper and mushrooms. Cook 5-7 minutes longer, until vegetables begin to colour and lose water. Reduce heat to low, stir in tomatoes, pepper flakes, basil, oregano, salt and pepper. Cover and cook 45 minutes, stirring occasionally. Just before serving, stir in lemon juice and parsley. On a sadder note, I finished picking the last of this year's garden harvest tonight. All the remaining tomatoes (both green and red), beans and peppers are off their mother plants and sitting on my kitchen table. The one good thing about all the green tomatoes is the fact that David's clued me into a fruit-mince that can be made with the suckers... though I don't have quite that many greenies on hand! Hopefully I can get one pie out of the lot, though - my dad loves the stuff! great movie and a great dish :) i'm a fan of ellie krieger's cornmeal-crusted ratatouille tart. but any form of this concoction can't go wrong! !